House Lawmakers Ask CMS to Back-Off MSSP Proposal. A bipartisan group of nine House members sent a letter to the Centers for Medicare and Medicaid Services (CMS) Administrator Seema Verma raising concerns about proposed changes to the Medicare Shared Savings Program (MSSP). The letter touts the importance of the Accountable Care Organization (ACO) program and urges CMS to revisit its proposal to cut the time in upside-only arrangements from six years to two, and to reduce an ACO’s share of savings from 50 to 25 percent. More Legislation Tackling Surprise Medical Billing. Senators Maggie Hassan (D-NH) and Jeanne Shaheen (D-NH) introduced a pair of bills last week that seek to limit surprising medical billing in emergency and non-emergency settings for group and individual market coverage. No More Surprise Medical Bills Act of 2018 (S. 3592) focuses on surprise billing for group health plan enrollees visiting an in-network facility, but seen by an out-of-network physician, for an emergency or non-emergency. The bill would prohibit providers from charging patients more than what they would owe an in-network provider. It also would establish a binding arbitration process (or allows states to create their own arbitration process) to resolve disputes between insurers and providers. Reducing Costs for Out-of-Network Services Act of 2018 (S. 3541) focuses on surprise bills for uninsured and individual market enrollees. The bill would cap the amount hospitals and physicians could charge uninsured and out-of-network patients who have individual market coverage through three sets of cap options for the state: 125 percent of Medicare fee-for-service rates (with an allowance in rural areas to set payments up to 200 percent of Medicare rates), 80 percent of the “usual and customary rate” based on provider’s billed charges, or the insurer’s in-network contracted rate for the service provided. Trump Administration Revises 1332 Waiver Guidance. CMS and the US Department of the Treasury issued new guidance related to a state’s ability to obtain a waiver of certain Affordable Care Act (ACA) coverage requirements. The Trump Administration announced a new name, State Relief and Empowerment Waivers, for the Section 1332 waivers, , and revised the guidance to give states additional flexibility in their waiver plans. Administration officials touted the new approach as a mechanism to expand choices in the individual market. Critics of the proposal stated that it could lead to an increased number of consumers with less comprehensive coverage, including short-term plans that exclude pre-existing conditions coverage. Expect this debate about the relative generosity or skimpiness of coverage to continue as the Administration continues to find ways to modify the ACA in the absence of a complete Congressional overhaul. Trump Administration Issues HRA Guidance. The Trump Administration announced proposed rules to expand opportunities for individuals to use their health reimbursement arrangements (HRA) or other account-based group health plans. The proposed rule allows individuals to use their tax-free HRAs to help pay for their individual market premiums, which was previously prohibited. In addition, HRAs used to pay premiums would satisfy the ACA’s employer mandate. The HRA guidance is the third in a series of announcements flowing from Executive Order 13813, “Promoting Healthcare Choice and Competition across the United States” issued in October 2017. The other two priority areas identified were short-term, limited duration plans and association health plans, both of which are already moving forward. Like the new 1332 waiver guidance, the HRA guidance provides another mechanism intended to increase flexibility and consumer choice with potentially damaging effects on comprehensive coverage. Medicaid Expansions Still Moving Forward. The Administration approved Virginia’s Medicaid expansion last week. The state will begin open enrollment on November 1, 2018, with coverage effective January 1, 2019. While the initial approval did not include work requirements, Virginia is working on a Section 1115 waiver that would implement incremental work requirements in coming years. CMS Administrator Verma has been supportive of work requirements, with several states getting approval for the controversial approach to expansion. The issue has also piqued the interest of the Medicaid and CHIP Payment and Access Commission (MACPAC). Last month MACPAC dove into the impacts of work requirements on Medicaid recipients. At the October meeting on Thursday, MACPAC held an additional session on the implementation of work requirements, specifically looking at Arkansas. Medicaid expansion is on the ballot in several states, including Nebraska and Idaho, on November 6. 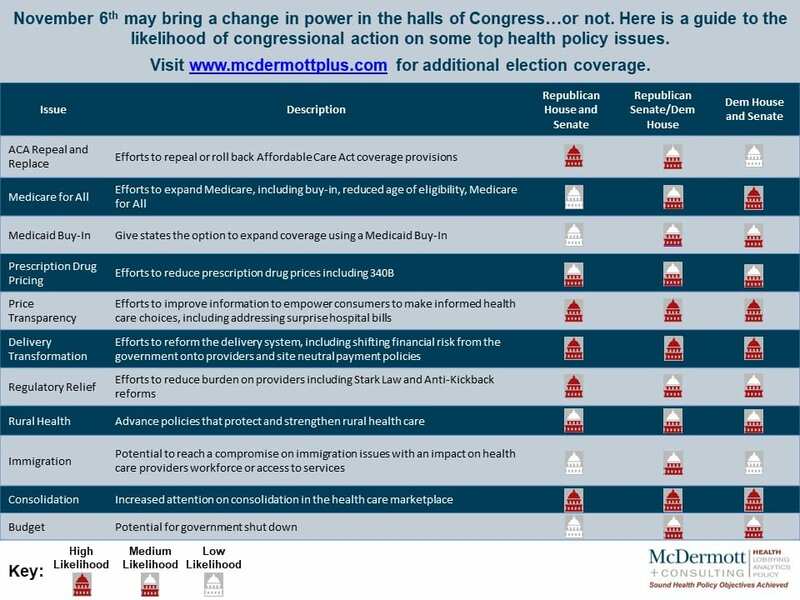 Watch for Medicaid expansion or contraction to be a hot button issue depending on the outcome of the Congressional midterm elections and perhaps more importantly, state gubernatorial races. President Proposes More Drug Pricing Reforms. On Thursday, the President and the Secretary of the US Department of Human and Health Services (HHS) Alex Azar announced that HHS is working on additional regulatory measures to implement more aspects of the drug pricing blueprint. This announcement came on the heels of a report released Thursday morning by the Office of the Assistant Secretary for Planning and Evaluation in HHS, which compares drug spending in the US under Medicare Part B with other countries. HHS is expected to propose a series of rules that would make changes to Medicare Part B through Center for Medicare & Medicaid Innovation (CMMI) demonstration projects, including allowing for the negotiation of more drug prices, benchmarking some prices against other countries’ and changing how doctors get paid for administering drugs to patients. As a first step, CMS issued an advanced notice of proposed rulemaking that proposes a CMMI project where Part B drug prices would be tied to a new international price index (IPI) model. Under the IPI model, CMS would no longer make payments for certain Part B drugs to participating entities. Instead, CMS would establish “model vendors” that would negotiate drug prices with manufacturers and distribute drugs to participating entities. CMS would pay the model vendors for the drugs and make limited “add-on” payments to participating entities. CMS intends for the add-on payments to reduce revenue losses under the IPI model and incentivize use of lower cost drugs. The advanced notice is open for comment for 60 days – and CMS should expect a lot of comments. A friendly reminder that two other rules relating to drug pricing (anti-kickback and Part D changes) are pending at the Office of Management and Budget for review. LAN Releases New Report on APM Adoption. The Health Care Payment Learning & Action Network (LAN) released a new report on alternative payment model (APM) adoption. The report shows that 34 percent of payments involve APMs, an increase from 29 percent in the year before but far below the 50 percent goal for the end of 2018. This finding was unsurprising given CMS’s gentle approach to the Merit-based Incentive Payment System under the Medicare Access and CHIP Reauthorization Act (the stick to move providers to APMs) and the modest pace of developing new APMs in traditional Medicare. We are heading into the home stretch for the election (check out our handy guide for likely congressional action on health policy issues). We expect the Administration to continue to be active, with expected payment rules coming within the next few weeks. For more information, contact Mara McDermott or Rachel Stauffer.